During 2012 and 2013 we will be surveying the Namibian Islands Marine Protected Area around Luderitz using visual and acoustic methods from a small ship. The aim of this project is to Investigate the distribution and abundance of Heaviside’s dolphins, dusky dolphins and other cetaceans within the Namibian Islands Marine Protected Area (NIMPA) and in the buffer zone between the NIMPA and the Orange River. To achieve this we are working with the Ministry of Fisheries and Marine Resources to conduct simultaneous ship based visual and acoustic line transect surveys. We are also working with Mr René Swift, from the University of St Andrews Sea Mammal Research Unit, who has built our 500 meter hydrophone array which will be able to detect the vocalizations of the whales and dolphins we encounter. 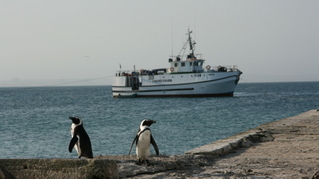 Using acoustic techniques is particularly advantageous in southern Namibia, where the wind and swell conditions limit the options for visual data collection. The NIMPA project will initially run for 2 years, staring in March 2012, and during which time the NDP researchers will be based in Ludertiz. The data collected will contribute towards providing a baseline assessment of the cetacean community (species, number) within southern Namibian waters that is relevant to long term assessments of environmental change. We hope to map the distribution and relative abundance of Heaviside’s dolphins and other cetaceans within and adjacent to the NIMPA and relate density to environmental variables (water temperature, upwelling, prey density) and human impacts. This will be the first time that Heaviside’s dolphins have been researched using towed acoustic arrays, so we are very excited about the outputs of our research and believe that the results can contribute substantially to the effective conservation and management of this species. Passive acoustic monitoring (PAM) of cetaceans (whales, dolphins and porpoises) involves using an underwater microphone (hydrophone) to detect and record the naturally occurring echolocation and social sounds they produce. PAM is routinely used throughout the globe to monitor the distribution and relative abundance of cetacean species and populations to answer questions about spatial and temporal habitat use and whether animals are increasing or decreasing in number (Van Parijs et al. 2002, Bailey et al. 2009). PAM is particularly useful for long-term monitoring, in remote areas and those where the prevailing sea conditions tend to be rough.